THE problem with getting older is that you get older so much more quickly. That slippery slope gets steeper with each passing year. This came home to me when we were packing up the caravan to go on holiday and Rita mentioned that it had been three years since we'd had a beach holiday. Our annual sojourn to Kingscliff was brought to a sudden halt when the Tweed Council decided to close their beautiful (and cheap) van park that held a couple of hundred caravans and turn it into a Rich-Man-Only- Paradise that caters to 35 vans and the same number of apartments that took all the prime sea-view possies. This was three years back and I guess we've been fairly busy in that time, what with moving home and all, but no wonder the subconscious was calling out for some sea-salt air in our lives. Replacing the absolute waterfront site we enjoyed at Kingy was, I thought, going to be an impossible dream, but salvation came our way in the form of Dave Rice of Rice Graphic Images at Wodonga, who posted a picture of their holiday at Tuross Head on the New South Wales South Coast this past January. Was the place as good as the pictures he posted? A phone call to good friends, Don and Linda Wishart to see if they were interested in joining us, and Rita jumps on the phone to book us in. Of course, no-one's ever heard of Tuross Head, except the people who go there, and it became apparent that maybe we were the only two people who'd not heard of the joint, because the earliest we could get a couple of sites on the beach-front was March 11. Now, all of a sudden, life had slowed to a crawl as we waited for the weeks to go by until we could hook up and hit the road. Finally the day arrived and we headed to the Wisharts for an overnight stay - they being two hours closer to our destination - before travelling in convoy to Tuross. From MooTown we had to head up the Hume then along the Barton Highway around Canberra, through Braidwood and down to Batemans Bay on the coast, then south to Tuross. The road over the range down to Batemans is as picturesque as you ever will see - and windy - and steep - and goes on for what seems like an eternity. And here is where a tiny seed of doubt has entered my mind. Because, as we pulled out of the driveway at home I noticed a drop or three of coolant on the driveway. The Territory has given us a bit of grief over the years but has never, ever leaked coolant. Another, even tinier part of the scone says, "What about Murphy,” and "From tiny droplets mighty rivers flow.” I watched the temp gauge all the way on our six-hour drive to Tuross and she behaved perfectly normally all the way here. But we have to climb that hill to get back home with "Giddy Up” behind us and nowhere to pull over should Murphy weave his magic. Still, that's all in the future. We arrive and set up with the back of the van virtually hanging over the sand. This is our idea of beachfront! Don and Linda set up and it's time for a drink or three and let our collective stresses wash away onto the white sands stretching out before us. Day two arrives and with it an offshore breeze that increases in velocity as the day goes on. Other vans along the beach front roll up their awnings in preparation for predicted galeforce winds overnight and Rita suggests we do the same. The term, "Yeah ... Nah,” is rapidly becoming part of my holiday vocabulary by now. You get the picture. Holidaying to me is all about sittin' and lookin'. Indeed the wind does pick up considerably overnight to the point where I'm mentally berating myself for being such a lazy sod and remembering how the same event happened on our first Kingscliff holiday - where I spent the entire night trying to save the awning from turning into a sail and taking the caravan with us in it, to New Zealand. 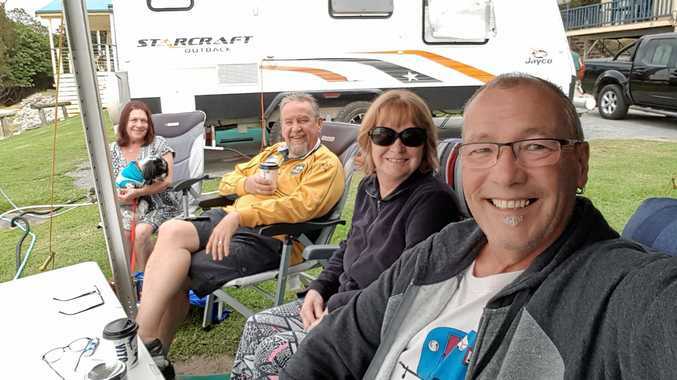 Although we rocked and rolled throughout the night, we awoke unscathed and I could happily walk past the other caravans along the foreshore, commenting on what wimps they all were. I just know that Murphy is going to get me back for my salacious thoughts. But in the meantime we have two glorious weeks where I have to do nothing except eat, drink, and be merry. I'm thinking we may take the long way home around the coast but, because Murphy and that bloody hill are going to get me. I know it, and so does he. Take care of you, Kermie.